A new record has been set for the fastest ever transatlantic flight in a subsonic passenger aircraft after one flew from New York to London in just over five hours. 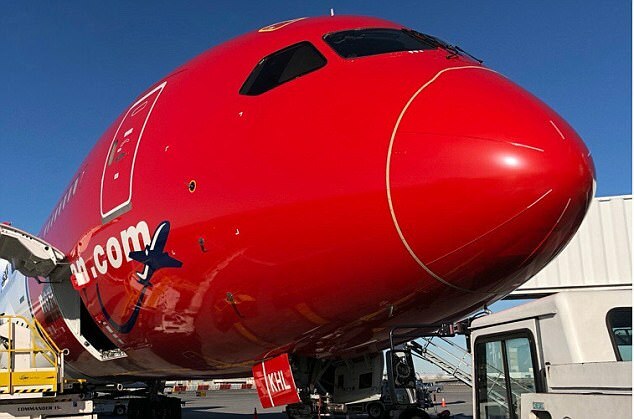 The Norwegian Boeing 787-9 Dreamliner was able to reach a top speed of 776mph as it hurtled across the Atlantic Ocean after being pushed on the 3,458-mile journey by an extra strong jet stream that at times reached 202mph. 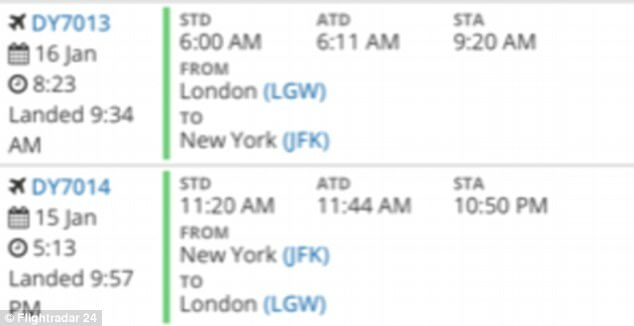 This meant that Monday's Norwegian DY7014 service from JFK to London Gatwick only took a total of five hours and 13 minutes, shaving 53 minutes off the expected flight duration. It broke the record previously set by a British Airways aircraft in January 2015, which was able to fly from JFK to London Heathrow in five hours and 16 minutes. 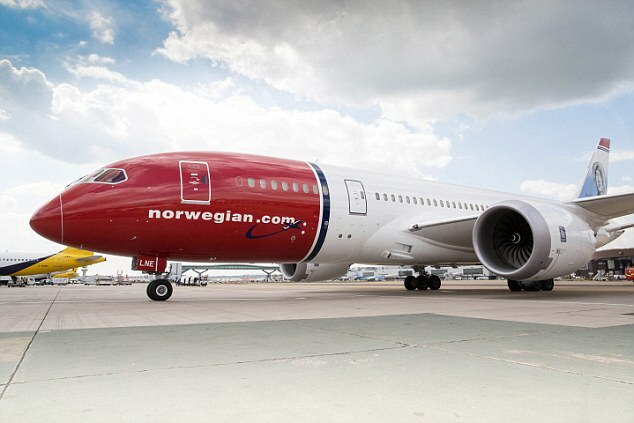 Norwegian, Europe's third largest low-cost carrier, operates double daily flights between London and New York using the state-of-the-art Boeing 787 Dreamliner. Monday's departure saw 284 passengers leave JFK at 11.44am local time before arriving in London at 9.57pm GMT. At the controls was Captain Harold van Dam, who revealed a more impressive record could have been achieved, but turbulence hindered them. 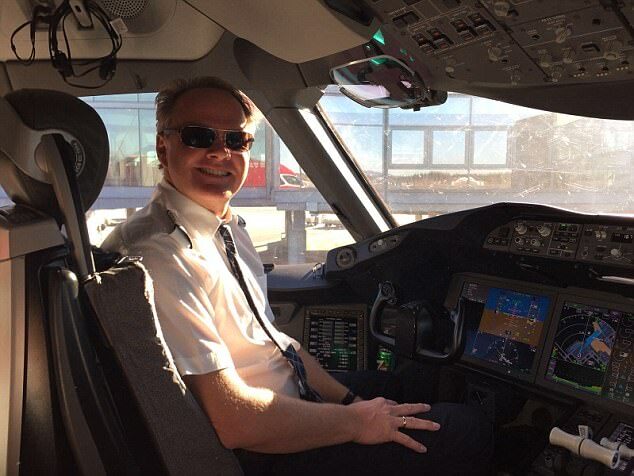 Captain van Dam said: 'The 787 Dreamliner is a pleasure to fly and it’s a great feeling to know that we have set a new record in this aircraft. 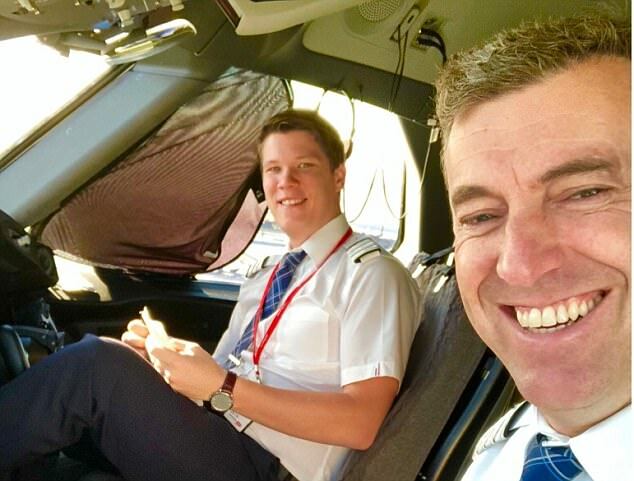 The day before the record breaking flight, fellow Gatwick-based captain Pascal Niewold was in charge of another New York to London flight that had a flight time of just five hours and 20 minutes - just four minutes short of the previous record by BA. 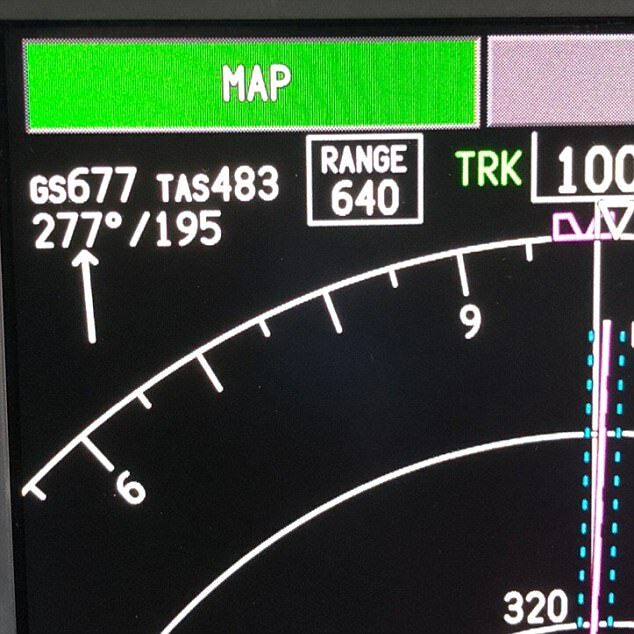 That flight was helped by a maximum tailwind of 224 mph and reached an even faster top speed of 779mph. And Captain Niewold added: 'The passengers and crew were very pleasantly surprised that we were already landing in London. 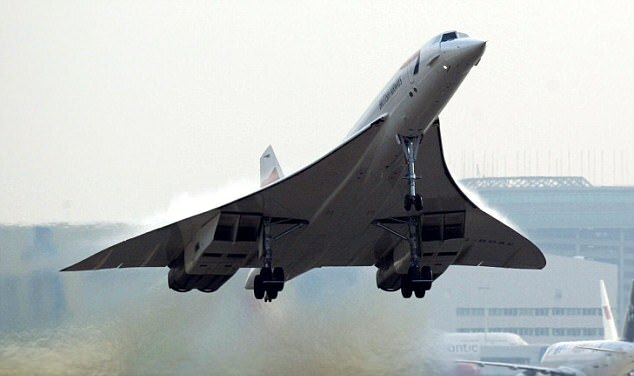 However, the fastest ever transatlantic crossing by a passenger plane was in February 1996, when a British Airways Concorde flight from New York to London took just two hours, 52 minutes and 59 seconds. That day, the supersonic jet was able to reach a top speed of 1,350mph as it hurtled across the ocean. The winter months can often mean that transatlantic flights from the US to Europe become shorter thanks to the jet stream across the ocean intensifying. 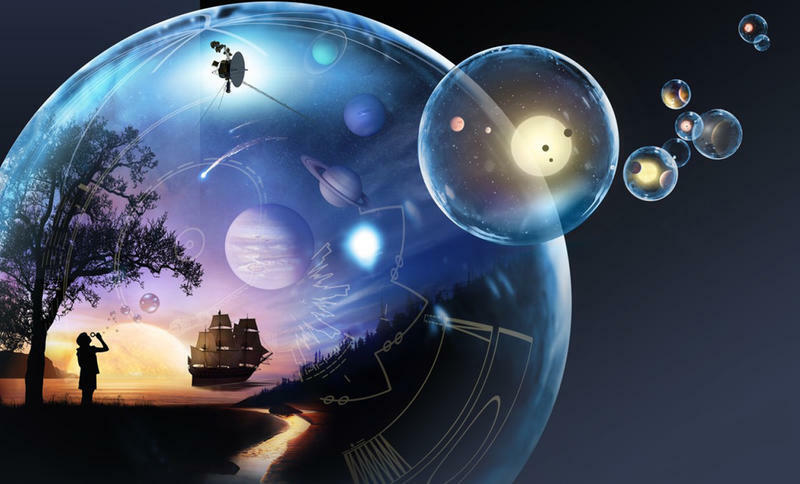 This is due to the temperature contrast between the equator and the North Pole being at its greatest, which can lead to wind increases across the Atlantic. However, the strength of the jet stream only increases in one direction and passengers travelling from Europe to the US may even see their flight times increase. Most people don't realize it easily out fly any fight jet in the world. Mach 2 super cruise all thew way across the Atlantic, waaaay ahead of its time.